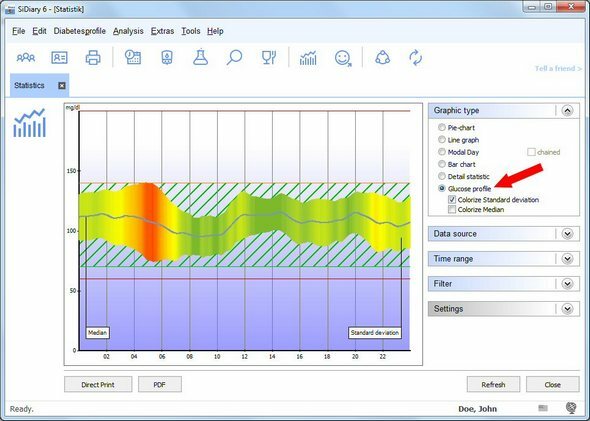 Of course, it is also possible with SiDiary to take the data from an FGM (Flash Glucose Monitoring) like the Abbott Freestyle Libre or a CGMS (Continuous Glucose Monitoring System) like the Dexcom G5 or Senseonics Eversense and evaluate them in the logbook. Some of these devices can store one reading every 5 minutes. That's 288 values per day. You can imagine that a table with 288 columns is anything but clear. For this reason, SiDiary does not present all such data in the table form you know from the blood glucose logbook, but as a graph over all 24 hours of the day. 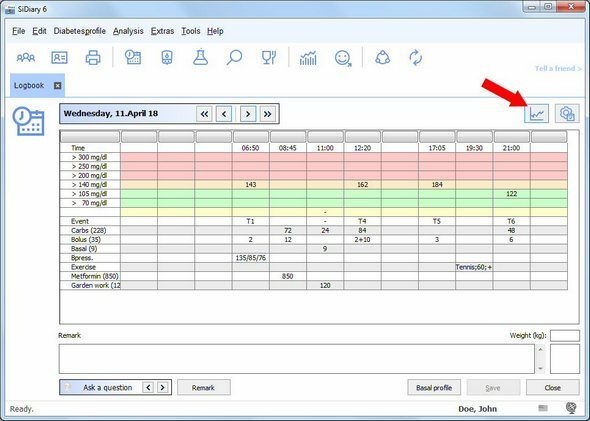 However, you can switch at any time between the table form (in which only values appear that are marked as blood sugar, i.e. "measured in the blood") and the curve form (in which the data of your FGM/CGMS are displayed as a daily curve) with a small button. This button is marked with a red arrow. 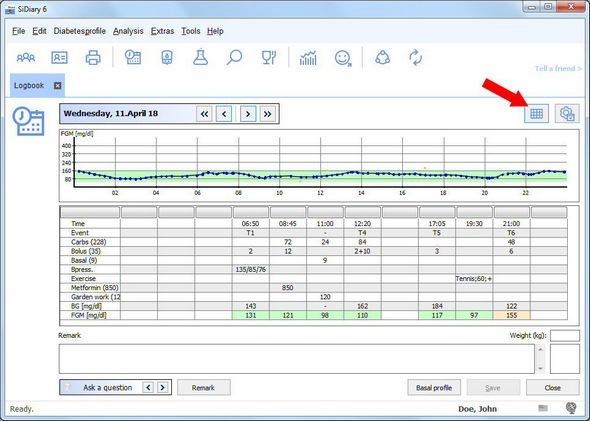 In the statistics you will find a very special graphic type for FGM/CGMS values: the glucose profile. The logic behind this is similar to the standard day: place all values of the evaluation period in a 24-hour grid to show what a typical glucose day of the user looks like. If you colorize the standard deviations - as shown here in the picture - then you can see very quickly at which time of day there are the biggest fluctuations (here, for example, in the time between four and six o'clock in the morning).